Dishoom is a relatively new Indian cafe in London serving Bombay street food. Steve and I love it and particularly recommend the vada pau and the virgin bombalada - a spicy remake of the classic cocktail the virgin pina colada. 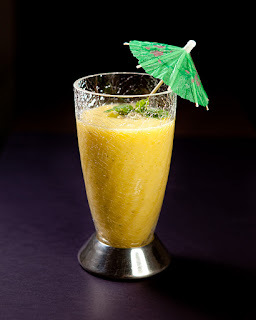 For those of you that can't get to Dishoom this is my version of the drink - enjoy! NB If you prefer your drinks slightly less virtuous simply add 50 millilitres of light white rum. Place the ice cubes, mint leaves, crushed fennel and cumin, salt, coconut milk and pineapple in a blender. Pour into a large wine glass.